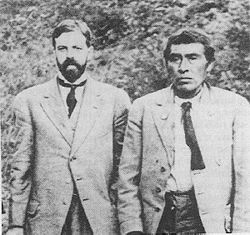 Anthropologist Alfred L. Kroeber with Ishi, the last known member of the Yahi tribe, (1911). Alfred Louis Kroeber (June 11, 1876 – October 5, 1960) was an influential figure in the development of modern American anthropology. The first student of Franz Boas and a prolific writer, he was one of the early proponents of Boas' theory of "cultural relativism," and a major force in bringing it into the mainstream of anthropology. Kroeber's work focused on Native American tribes, and he invested his energy into recording every detail of their cultures, not only the material aspects, but also their social structures and roles, as well as their moral and spiritual beliefs. Due to his efforts, knowledge of the way of life of these peoples has been preserved. Alfred Louis Kroeber was born on June 11, 1876, in Hoboken, New Jersey, as a second-generation German immigrant. His father came to America when he was ten years old, and settled down in New Jersey. Kroeber, however, grew up in New York City, where his mother was born. Kroeber's family cherished their German roots, speaking German at home, and raised their children with strong sense for their cultural inheritance. Kroeber entered Columbia University when he was 16 years old, and eventually received his B.A in 1896, and M.A. in 1897, both in English literature. After meeting with Franz Boas, professor of anthropology at Columbia, Kroeber decided to enroll in the graduate program in anthropology and psychology. He earned his Ph.D. in 1901, after spending two years of fieldwork studying Arapaho Indians and writing his dissertation on their symbolism. After his graduation in 1901, Kroeber moved to California, where he was appointed curator of anthropology at the California Academy of Sciences in San Francisco. He started teaching and became the first member of the new Department of Anthropology at the University of California at Berkeley. Kroeber spent most of his career there, developing the anthropological department and enriching the university museum's collection of artifacts. Kroeber married Henriette Rothschild in 1906, but the marriage ended tragically in 1913, when she died from tuberculosis. Kroeber himself developed an inner ear ailment, which left permanent deafness in his left ear. During this time, Kroeber had become the caretaker of "Ishi," who claimed to be the last surviving member of the Yahi Indian tribe. Kroeber worked with Ishi, studying his lifestyle, until Ishi also died of tuberculosis in 1916. Affected by these tragedies, in 1918, Kroeber decided to leave anthropology and became involved with psychoanalysis. This sudden change in his career was brief, however, and Kroeber returned to anthropology in 1922. In 1926, he remarried, to Theodora Krakow Brown. They had two children, Karl Kroeber, who became professor of humanities at Columbia University, and author of numerous books on the Romantic poets, and Ursula K. Le Guin, the science fiction writer. He also adopted the two children of Theodora's first marriage, Ted and Clifton. Kroeber retired in 1946, but continued to lecture, research, and publish until 1960, when he died from heart failure in Paris, France. The anthropology department building at the University of California was named Kroeber Hall in his honor. As an anthropologist, Kroeber was more than a well-known name. He was the first student of Franz Boas and the main proponent of his theories. Also, Kroeber was the second American to earn a Ph.D. in anthropology. He spent many years studying different Native American tribes, especially in California and the American West. Kroeber is credited with developing the concepts of cultural areas and "cultural elements" (Kroeber 1939/2000). A cultural area is a geographical area with relatively homogenous human activity (culture), while a cultural element is an essential part of what constitutes a culture. Like Boas, Kroeber believed in "cultural relativism," the theory that one’s cultural beliefs or behaviors can be understood only from within one’s own culture. Cultural relativism was thus in direct opposition to the theory of cultural evolution, namely that cultures evolved from primitive to more developed. Although known primarily as a cultural anthropologist, Kroeber also did significant work in archaeology, and contributed to anthropology by making connections between archaeology and culture. He conducted excavations in New Mexico, Mexico, and Peru. Kroeber also worked together with Roland B. Dixon on the classification of Native American languages, being responsible for groupings such as Penutian and Hokan languages. Kroeber and his students collected important cultural data on western Native American Indian tribes. Kroeber was not only interested in the material aspects of their culture—their pottery, weapons, dwellings, etc.—he also studied their symbols, social roles, and moral beliefs. He became particularly interested in the phenomenon of the Native American berdache—a biological male who assumed a female role. Kroeber's work on preserving knowledge of California tribes appeared in his Handbook of Indians of California (1925). This effort to preserve remaining data on these tribes was termed "salvage ethnography," a concept developed in his work with Robert Lowie. The most notable example of his attempt to save Native Indian cultures is Kroeber's work with "Ishi," an American Indian who claimed (though not uncontroversially) to be the last California Yahi Indian. Kroeber studied Ishi for several years—his tool making, language and customs, in the attempt to salvage what remained of the Yahi tribe. When Ishi died in 1916 his body was autopsied and his brain was removed prior to cremation. Kroeber sent the brain to the Smithsonian Institute, where it remained in storage in a deerskin wrapped jar until it was discovered and returned to leaders of the related Pit River tribe for appropriate burial in 2000. Kroeber never wrote about Ishi himself, but Theodora published his story, Ishi in Two Worlds, one year after her husband's death (Kroeber, T. 1961). Krober's son, Karl, and stepson, Clifton, also edited a book on the Ishi case, Ishi in Three Centuries (Kroeber and Kroeber 2003). Kroeber was a very productive writer. During his career, he published over 500 books and articles. His book, Anthropology (1923), was widely used for years as a standard university textbook. Kroeber is best known for his work on preserving knowledge of Native American cultures, especially the Yahi tribe through his work with Ishi. Besides cultural anthropology, Kroeber was well known in archaeological circles. He helped establish archaeology as an essential component when investigating culture. His influence was so strong that many contemporaries adopted his style of beard and mustache as well as his views as a social scientist. Fagan, Kevin. August 10, 2000. Ishi's Kin To Give Him Proper Burial / Indians to bury brain in secret location in state San Francisco Chronicle. Retrieved May 6, 2014. Theodora Kroeber biography California Authors. History of "Alfred L. Kroeber"
This page was last modified on 2 March 2019, at 23:55.